What should I keep in the office, and at home? How do I rotate them to avoid things being boring? Is it OK to leave expensive things at the office? If I cycle in a suit, how can I avoid wearing it out? How can I transfer clothes to the office on a bike? I have cycled to work for 12 years, and I should say up front that although there are ways to mitigate these issues, they certainly can’t be solved. I sometimes fantasise about commuting by train, just so I can have the full selection of clothing to choose from every morning, and more need for coats, hats and scarves. Unfortunately, you can’t have both. Every day I cycle to work with a shirt, socks and underwear. The shirt sometimes gets a little crumpled, but I pack it carefully. I don’t use a box, though I have used a Shirt Shuttle in the past (current bag too small for it). Ideally the shirts would be washed, pressed and kept at the office, but this (a) is expensive, (b) takes up too much room, and (c) usually involves dry cleaning, which would substantially shorten the life of the shirts. I often bring in small things like ties or hanks too, but you are essentially composing an outfit in your head, based on what’s at the office. This is a bit of a pain and inevitably leads to safer, less interesting combinations. To keep things fresh, I swap clothes around once a week. There will be usually be one day where I’m going out in the evening and therefore not cycling. On this day, I take in a couple of new items, like a jacket and shoes, and take two home. The problem with that, of course, is I have to carry things around on a night out. But you can also (with a little more thought) wear those new clothes into the office in the morning, and wear the old ones home, having changed at the end of the day. That answers questions (2) and (5) above. The answer to (4) is, don’t. Not in a suit anyway. 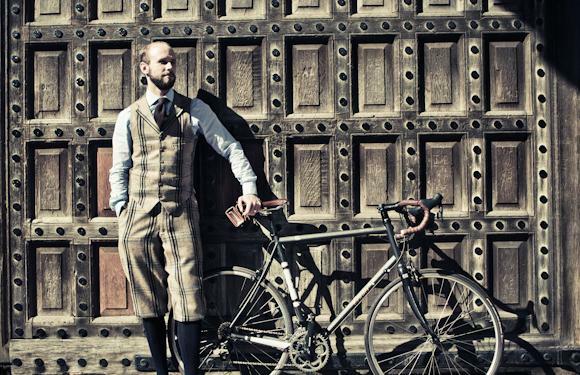 If you really have to cycle in smart clothes, at least do it in a jacket and chinos or jeans. These trousers will wear a lot slower, and if they do wear out, at least you’re not left with a stranded suit jacket. I often cycle to appointments on a Santander rental bike (what I still call a Boris bike). And I try to follow these recommendations for that. Normally chinos and a jacket; rarely flannel (it wears out very fast); usually a short coat, gloves and a beanie, not a fedora. Again, it’s a shame that clothing is limited by means of transport, but cycling is always nicer than the tube. Expensive things are usually fine at the office. If you put them away, they will usually be covered by company insurance. Though worth checking. And finally, what should you actually keep at the office? In the reader questions, Rob mentioned twice that he ends up having boring things at the office. I’m afraid that’s inevitable with such a small wardrobe, but I do try to keep this last slot free for something I’m experimenting with or learning to wear. If anyone has more specific questions, please let me know. You can follow the discussion on Commuting by bike – what to keep in the office by entering your email address in the box below. You will then receive an email every time a new comment is added. These will also contain a link to a page where you can stop the alerts, and remove all of your related data from the site. I think you must have more space at your office than I have in my house. It sounds exhausting all this forward planning you have to do. I never realised you put so much work into it! I feel very smug now having a short drive to work. Thanks, yes that’s a good point Adam. Its worth saying that most home insurance excludes clothing from New for Old cover and so any claim settlement would be reduced based on the age of the item. Back in my claims handling days under 1 year old 100% was paid, under 2 years 75%, under 3 years 50% and over 3 years old was 25% of its value. With most mass market RTW items your probably lucky if anything lasts 3 years but inevitably for the items on this blog at 3 years old most here would argue they are only just about broken in. Hi Bob. Very True, but it does depend on your policy and this is not really a discussion for the “mass market” individual. I do not want to write an essay and bore everyone so i wont but Cheaper policies do have more restrictions than others (especially HNW insurers) However with good insurers common sense will apply. If a Full re-craft on a pair of G&G’s is £300 then the most deduction one would be able to settle is £300 as they would be as new. The wardrobes of some of the readers here, and my clients cost more to replace than a small family home. It is a serious asset that needs consideration..
1. Use a smooth leather saddle to prevent friction (I use a standard Brooks B17). Nylon saddles kill trousers! 3. Do not go too fast, enjoy the ride (prevents sweating). I agree with the points ZR3RS has made and would also note that full length metal mudguards will rolled edges are essential for keeping road spray and puddle contents off your clothes, even in dry climates. I live in Wellington, NZ where temperatures and humidity levels are moderate. On warm days I roll up the jacket and stash it in the saddlebag. On cooler days a cashmere scarf keeps wind chill at bay and also minimises sweat staining shirt collars. A Kangol 504 cap works well for me as a baldie, and also folds up nicely into a trouser pocket. I usually wear a merino singlet and an I find an overcoat is never necessary, just a scarf and merino gloves. Being able to use the bike to get around town for lunch and appointments is really handy and that’s something those who commute on race bikes can’t easily do. I wear normal dress shoes and use flat pedals with toe clips. I don’t ride as fast as most other cyclists, but I’m quicker overall because I don’t need to shower and change twice a day. just a quick question on the Shirt Shuttle: Does this work satisfactory, in your experience? I’ve been looking for something to ensure a halfway decent crease protection when I travel and use a holdall, but only found a softshell something in the camping / backpack supply store which does not do the trick. I use one roughly once a month, and it works well. It does take some practice to get the folding right, but then the only drawback is the bulk. Fine for an overnight bag but too big for a commute, in my experience. How many shirts can the Shirt Shuttle hold? Presumably just one? Interesting post and one very relevant to me as I have just started cycling to work again after 3 years of being able to walk (the joys of living in Edinburgh). Prior to that I cycle commuted for 6 years. Although it’s only a 5 km ride it’s by far the best way to get to and from the office. Though I do occasionally run as well, which offers up it’s own challenges wardrobe wise. Like you wash and iron my own shirts as I cant justify spending 60 quid a month on washing and ironing. That money could be far better spent on clothes or bike bits. I fold them and put them in the laptop sleeve of my messenger bag, what do you use to carry your stuff? We have a dress down Friday so I tend to cycle in those days in my chinos, but still carry a shirt/ polo shirt. Rapha do some reasonable not biky cycle stuff which I use to wear on the ride in, as full Lycra seems a bit much for a short jaunt through town. Although the Lycra was useful when i used to commute to Glasgow as I often got two seats to myself on the train! Rotation wise, I am not as fortunate as you to have a large wardrobe of suits (I only have 3, all bespoke) I tend to keep one at work and the other two at home. But I do have several pairs of trousers at work and carry in knitwear to go with them. I have no issue leaving clothes at work, my office was broken into a while ago and my good overcoat was stolen, no problems with the insurance paying out (which I then used towards a bespoke polo coat). This is the one area where I don’t feel I am covered as I keep the polo coat at home. I think a second overcoat will be my next commission but one. What shoes do you keep at work? Another of the pains in commuting is brining a pair home each week to clean and re-shine. Appreciate you might have covered this elsewhere so apologies. What should one wear underneath a roll-neck pull-over? Nicely written piece Simon, and it raises a couple of points. Leaving this many clothes at the office seems an unlikely option for most. Apart from the wardrobe space required, inevitably the insurance of these items would be an issue. Given your list above, surely most companies would have a fit at being asked to ensure adequate coverage for (what, circa) £30,000 of garments? And on a lighter note, those wonderful Hunstman tweeds, how often do you actually wear them? And if you share an office, you’ll need shower gel and a towel, or a very effective deodorant. Could you comment on Drake’s ties partially made from nylon? I have no chance to look at them in real life and am tempted to buy one (“Navy Handrolled Puppytooth Woven Alpaca & Wool Tie”) in their current sale. At the same time “20% nylon” is triggering all sorts of warning bells. Would you recommend or not? Thanks, that’s good to hear. Did you happen to have a chance to see/touch one of those specific ties at Drake’s? I’m thinking it could fit very well together with corduroy pants and a large Cardigan, however the “weird” material mix is very hard to judge from just photos. For what I’ve been told, the nylon helps to stabilise the blend of fabrics and give it better durability. Those alpaca/wool ties have a very soft, almost cashmere like, handle. I cycle to work here in Canada during the warm months (about 6 months of the year). I do much the same as Simon but my workplace is relatively casual so it’s all a little simpler. I also have the benefit of a locker and showers at work. With the locker I can keep some shirts at work. Add in a suit, some chinos and a couple of sport coats and it works. What bike do you ride and how long is your commute Simon (kilometres and time needed)? I also have a locker (which holds all the clothes mentioned) and showers. I ride a Condor steel frame for commuting (pictured in the middle shot of this post). I wear Rapha city gear exclusively (done a lot with them over the years). And the ride is about 25 minutes. I ride all year, wind, rain or snow. Switching to racing gear for rain usually (overshoes, rain jacket, cap etc). I appreciate it’s not as cold here as in Canada though! I’m on a Cannondale Synapse road bike. I wear Icebreaker merino wool cycling jerseys. I love them. They are good for comfort even in hot weather and can be worn many times before they begin to smell. Another possible post for the future could be on purchases you regret or items that you bought that have proved difficult to wear due to a lack of versatility, being too delicate, etc. And maybe some guidance on how to avoid making those kinds of purchases. I’ve noticed that you’ve mentioned your suede Cifonelli jacket. Is it the brown one? Can’t say that I’ll ever be able to afford one from Cifonelli but I’d love to see the images of this? Have you done a post yet on this finished item – if I’m not mistaken it was being fitted not that long ago? Have you moved north of the river?!? Nope, still in Peckham. Why? My commute is about 9 km, I think that’s similar to yours, and it also takes me about 25 minutes. I thought I was slow but maybe not. Do you have to ride on roads mostly? I can ride most of my route I bike trails and multiple use sidewalks. Thanks for writing this. I’m not quite sure if I am pleased that I am consistent in my comments or worried my comments sound like I am constantly complaining about my boring work wardrobe! I follow a very similar regimen to you and for many the same reasons. One of the things I haven’t cracked is rotation, so I’ll start thinking about how to work that in. I think I worry too much about not having something available at home when I want it. In reality the vast majority of opportunities to wear tailoring are at work. So I should also keep more at the office. I don’t have quite as much variety in my work wardrobe (or overall wardrobe for that point), so introducing a few of my more interesting separates seems a good idea. As does another pair of more interesting and “rotatable” shoes. I also find sleeveless cardigans invaluable similar to the logical waistcoat theory. Thanks for the thoughts its nice to know we all face the same problems regardless the size of our wardrobes. The slicks product looks good but isn’t the real solution to have one’s butler cycle in advance with your needs for the day on his or her cycle. Perhaps slick could manufactur a butler’s trailer? Not a cycling question, but how do your colleagues in your day job react to all of this? As regards to your Cifonelli waistcoat, on the back is it lined in the same material as the rest of the suit or using a lining? It has a lining, though it’s a pure silk with a very matte finish. Would you consider doing an article on how you pack suits etc for travelling. It’s not always easy to use suit carriers on planes. Is there a way to fold suits etc so they don’t crease? Do you have any recommendations for suit luggage? I actually had a question about clothed backed waistcoats, but was waiting for an appropriate topic to come up. Clearly the reason for having a 3 piece made with a matching cloth backed waistcoat is so the waistcoat can become its own piece and be worn on its own without the jacket. However if you were having a 3 piece made what fabric would become versatile enough to wear the trousers waistcoat and then a separate jacket.. Without it looking like 2/3rds of a suit. Or is this taking versatility too far. My God! I’m utterly impressed by what it takes to live up to two contradictory challenges at once for all those who cycle to work! A very interesting, if surprising, conversation is really going on here! I love cycling though, but not to work. A great deal of pieces of advice is offered here, even for anyone who just happens for whatever cause to have to cycle while being mindful of remaining stylish! Would love to see your post on ‘learning’ how to wear something new. Several times I’ve been surprised by my purchases. A pair of boots I thought would go well with jeans, but proved far too smart for jeans. Similar experience recently with a scarf. None were disasters, but resulted in purchases that were a bit less flexible than I had anticipated. Congratulations Simon on becoming the first person ever to live/work in London and say ‘I sometimes fantasise about commuting by train’. Most of us would give anything to never have to do it again! Seriously though, great article and I totally recognise the logistics involved. I have two nights out which will require a complete change of clothes next week, as well as a couple of lunches and breakfast meetings. It’s no exaggeration to say that I’m already trying to plan exactly which suit, tie, shirt and pair of shoes will need to be where and when! One thing overlooked in your list of clothes at the office is some specifics about the shoes. Some details and thoughts on why some shoes and not others would be helpful. I cycle to work as well, a ride of 5.5 km. Due to the short distance I usually ride in my work clothes, packing a dress shirt and wearing a t-shirt for the ride, unless it’s windy which minimizes the sweating all togheter. Does anyone have any tips on how to prevent this except the obvious don’t cycle in chinos? I had a rather wet bike ride into work this morning. I have a good cycling jacket and helmet cover, so my upper body stayed dry. What do you wear on a rainy ride? Is there something that keeps your legs dry and a shoe cover that keeps feet dry? We have moved office locations and I no longer have a shower available at work so wet and grimy legs are harder to deal with now. Thanks Simon. Just wearing my regular cycling clothes in the rain is also what I have done until now. But my legs do get covered with grime from the road. Without access to a shower at my new location it is difficult to clean up properly. I did some research and as a first step I will add fenders to my bike. There are some good ones for road bikes and do a lot to stop spray from the tires hitting the bike, your legs and shoes. If that doesn’t work then it will be waterproof trousers and overshoes. Is the Shirt Shuttle really worth the money? Or is the old “folding the shirt round a magazine” technique (http://www.telegraph.co.uk/men/the-filter/instant-expert/10464845/Instant-Expert-How-to-pack-a-shirt-without-it-creasing.html) just as good? Thanks in advance! Returning to this thread with a (hopefully) related question. 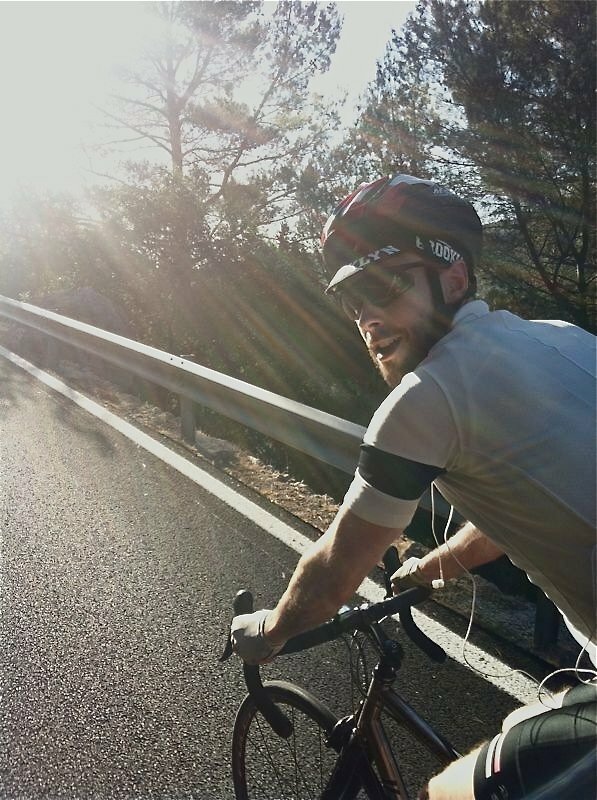 Simon I think you mentioned somewhere else that you wear Kask helmets. I need a new helmet and am considering Kask. Some reviews of them mention difficulty wearing sunglasses and eyeglasses with them. Something to do with the straps and tightening mechanism pushing on the arms of the glasses. Have you had a problem with this?